It’s winter, and winter spells delicious. The cold weather encourages us to stay inside to cook rather than hunt down food in the wilds of our shopping centers. Maybe that’s why holiday season comes at the end of the year. Either way, there’s going to be a whole lot of cookin’ going on. Whether you’re cooking for friends, family or yourself, you are going to need keep an eye on what’s on the stove. Often, this means a kitchen timer. 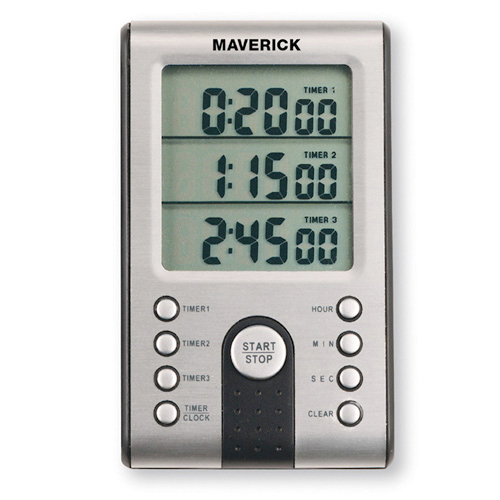 The Maverick Professional Digital 3-Line Timer and Clock keeps track of up to three events at once. Most stovetops have four burners, so if you’re cooking for a crowd, I guess someone will just have to stand guard on the fourth burner. That is, unless you can think of a way to avoid Aunt Sally’s Boiled Green Bean Surprise this year.